Nike Classic Cortez Leather PRM (Black / Black - Gum Light Brown - Sail). Nike Classic Cortez Leather PRM ( Black / Black-Gum Light Brown-Sail).Add to Flipboard Magazine. October 7, 2016 by SportswearFix™. Red, black, patent leather, suede and soft…we’ve seen tons of Cortez releases in the past but never has there been such an outstanding – one above all – variation of this shoe. The uppers are constructed from a dense array of snakeskin scales – in suede of all leathers. We’ve seen snakeskin in the past and rest assured…there’s nothing else quite like this on the market. The micro-rippled sole – in gum – matches the density of the scales on the uppers. Consumed somewhere in the middle is Nike’s Swoosh and at the back the embossed typographic branding. It’s almost as if the entire silhouette has been consumed by a suede black mamba. This dope version of the NIKE Classic Cortez Premium Leather is hitting Eastern Europe before it comes to the Americas. The Nike Air Max Tavas receives another all-black finish, following a recent offering with subtle speckles on the sole unit. This particular variation of the silhouette incorporates a seamless upper as well. Breathable mesh consists as its toe box component, while tonal synthetic overlays adorn across its vamp, which also acts a water resistant layer. Furthermore, a suede heel unit with miniature dots comprises the model’s upper composition. You can Find the kicks Now Through Asphaltgold. PUMA X FILLING PIECES BLAZE OF GLORY STRAP. In a heretofore unprecedented move, two competing footwear brands have joined forces to produce a collaboration that emdodies the essence of each company while also transcending the sum of its parts. The PUMA x Filling Pieces Blaze of Glory Strap is a fusion of the clean and modern identity of Filling Pieces with the iconic sports aesthetic from Puma. Filling Pieces deconstructed the Puma Blaze of Glory and rebuilt it using the finest FP materials and attention to detail, resulting in a luxurious and contemporary version of Puma's classic '90s runner. 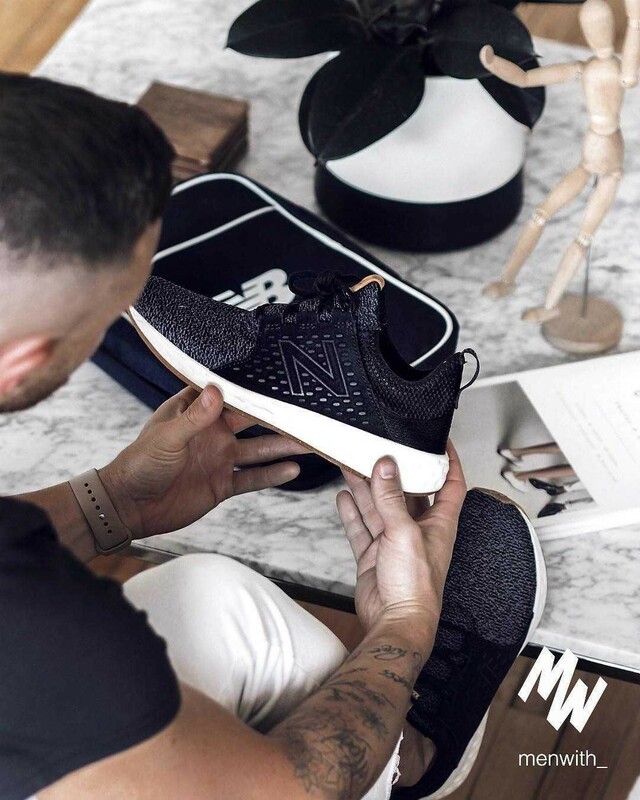 The most noticeable redesign appears on the shaved down toebox, where high quality leather strips are woven across and around the toe. A cleaner, slimmer upper made of leather, nubuck and mesh is bisected by a large elastic strap across the vamp, augmenting the leather wings which hold the laces. Sneakers : Nike Wmns Roshe One ‘White / Black’ . Style and comfort go hand-in-hand with Nike Womens Roshe One in the clean White colorway. Inspired by the practice of meditation and the art of Zen, the Nike Roshe One was designed to be as simple as possible. SNEAKER: AIR PRESTO GPX "OLYMPIC". The Air Presto was hailed as a "T-shirt for the foot" by Nike when it debuted at the dawn of the century to coincide with that year's Sydney Olympics. Now Nike is revisiting that initial "Olympic" edition in honor of the upcoming Rio games. This GPX model features a grey Dynamic Stretch Mesh upper printed with an array of concentric circles, which are somewhat reminiscent of the Olympic rings, and enclosed by the quintessential molded, midfoot "finger" overlays. The dark blue Phylon midsole hosts a red swoosh that matches the red Duralon outsole, and contains an Air-Sole heel unit for soft cushioning. An embroidered USA Track & Field logo on the tongue provides the final touch on this patriotic OG retro. Sneakers: Nike Cortez Ultra Moire . The Nike Cortez is a classic model that played a small-but-notable part in the beloved 1994 film Forrest Gump. Unsurprisingly the colorway that was featured in the film has taken on a life of it’s own and gets tons of love every time it pops up. This time Forrest’s colorway is attached to an updated version of the sneaker known as the Nike Cortez Ultra Moire. This version of the model is basically a one-piece molded silhouette that is covered in perforations for breathability. The advancements continue to the outsole, with it’s three tiered foam cushioning system gives the glistening white model a smooth ride. You can Find the kicks Now Through Nike Store.